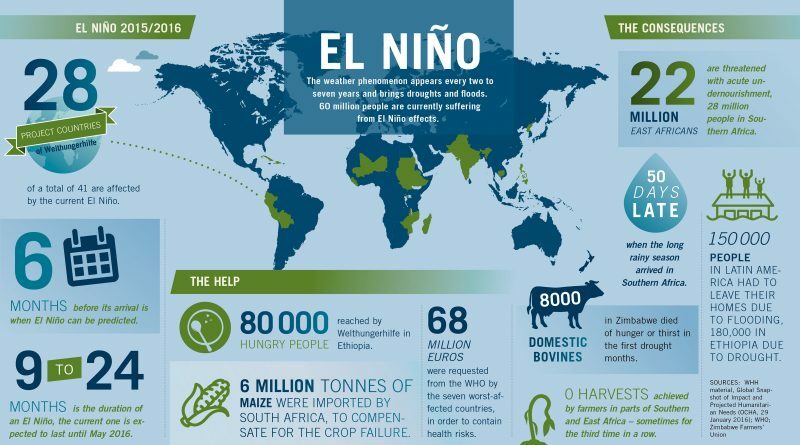 Between 2015 and 2016 the world has witnessed the strongest El Nino since 65 years. The effects have been catastrophic, producing massive drought in Africa and Australia and destructive floods in South America. Step by step…What El Nino is? 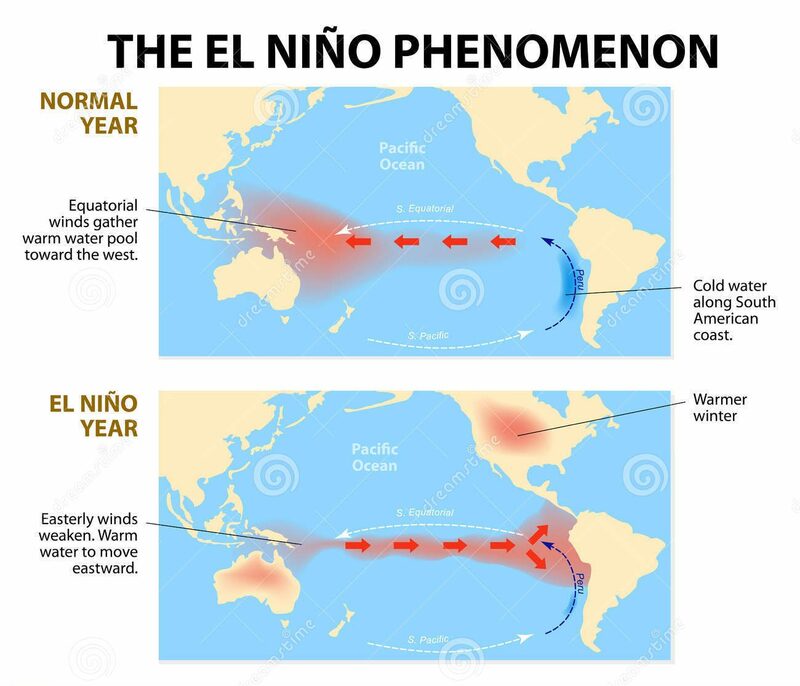 The Peruvian fishermen gave name to this climate phenomena, calling it El Nino (the kid); exactly El Nino and his counterpart La Nina, are part of a alternating warm and cold events in the tropical Pacific. It is a naturally occurring ocean-atmosphere interaction which results in a 2 to 7 years cyclical fluctuation of atmospheric and oceanic temperature and circulation patterns in the Pacific Ocean. Normally the difference between high and low atmospheric pressure between Eastern Pacific and Oceania causes trade winds from East to West. The temperature of the Ocean rises about 0.5 Celsius degree, causing warm water flowing eastwards from Indonesia. This prevents the upwelling of cold nutrient-rich water essential to biological production and thus reduces fish catches in Peru and Ecuador. Indeed, the economic effect of this whether oscillation are really huge; a University of Cambridge Working Paper shows that while Australia, Chile, Indonesia, India, Japan, New Zealand and South Africa face a short-lived fall in economic activity in response to an El Nino shock, other countries may actually benefit from it, for instance, Argentina, Canada, Mexico and the United States. The IMF estimates a significant El Niño can boost the GDP of the United States by about 0.5% (due largely to lower heating bills) and reduce the GDP of Indonesia by about 1.0%. 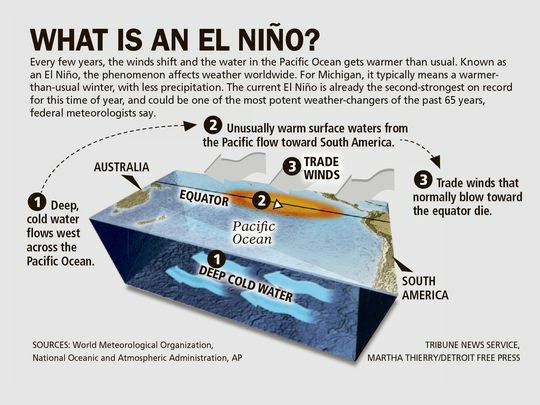 El Nino counterpart, is his sibling El Nina that produces the opposite effects, lower water temperature which as a result can lead to intense storms in some places and droughts in others in the Pacific Ocean. What is alarming is that the scientific evidences show that the twentieth-century El Nino events are stronger and more frequent compared with the previous events over the past 130.000 years!!! El Nino and global warming… Any need to worry? Although we need more data, because is too early to conclude that recent global warming is the cause of the more frequent and intense events observed recently. However, if more and stronger El Nino are coming this would have a significant and devastating impact on agriculture and ecosystem in Australia, Southeast Asia, East Africa and India. There could be greater global uncertanty for rain-fed crops, fisheries, drinking water supplies and other economic activities. Moreover, extreme El Nino events reduces oceanic uptake of carbon dioxide, weakening our challenge to CO2 reduction in the atmosphere, as the whether conditions the phenomena creates not only limit the ability of forests to draw down CO2 from the atmosphere but also trigger huge fires around the globe that inject extra carbon into the air.